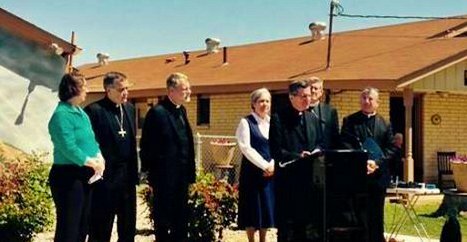 Archbishop Gustavo Garcia-Siller calls for an end to immigrant family detention during a press conference in Dilley, Texas. Catholic and Evangelical Lutheran bishops visited today with young mothers and children who have fled violence in their home countries and are now incarcerated at Dilley Detention Center in Dilley, Texas. The bishops called upon the federal government to halt the practice of immigrant family detention, citing the harmful effects on mothers, children and the moral character of society. Among the bishops present were Archbishop Gustavo Garcia-Siller of San Antonio and Bishop Eusebio Elizondo, chairman of the USCCB Committee on Migration. In response to the influx of some 60,000 migrant family members who arrived along the southwest border in 2014, the federal government expanded its number of family detention centers across the country. Locations for these facilities include Karnes and Dilley, Texas and Berks, Pennsylvania. The purpose of these detention centers is to expand the ability of the federal government to detain migrant families on their arrival. Migrant families (typically young mothers and children) apprehended while crossing the border by U.S. Customs and Border Protection are placed into the custody of Immigration and Customs Enforcement (ICE). ICE then places these immigrant families into family detention facilities. Family immigrant detention facilities are described by ICE as “residential facilities,” and detained families are considered “residents.” In reality, however, these detained families have limited freedoms and are forced to live in a highly restrictive setting. Many of these detained migrant families have valid, international protection claims that deserve fair adjudication. The United States bishops believe that during this process they should not be held in detention for indefinite periods of time. Children should not be locked up in prison-like facilities that restrict their movements and stunt their psychological and emotional development. Placing vulnerable women and children in detention who have experienced extreme persecution and violence contravenes our moral and religious principles to protect the defenseless and welcome the stranger. Instead of incarceration, the bishops support community-based alternatives to detention programs that are more humane than the mandatory detention programs currently in place.